Google is turning some of its data centers into works of art. It’s commissioned artists to paint giant murals on the outside of four of its buildings, and has shared the first two to be completed. The Data Center Mural Project picked four artists to brighten up the outside of some buildings which most would agree are at best anonymous and at worst, downright ugly. The first two are on display at a site including videos and image galleries, while two more are in production. In Mayes County, Oklahoma, Jenny Odell symbolized the place of data centers in our lives, by taking Google Earth imagery and extracting features to combine into a pattern. 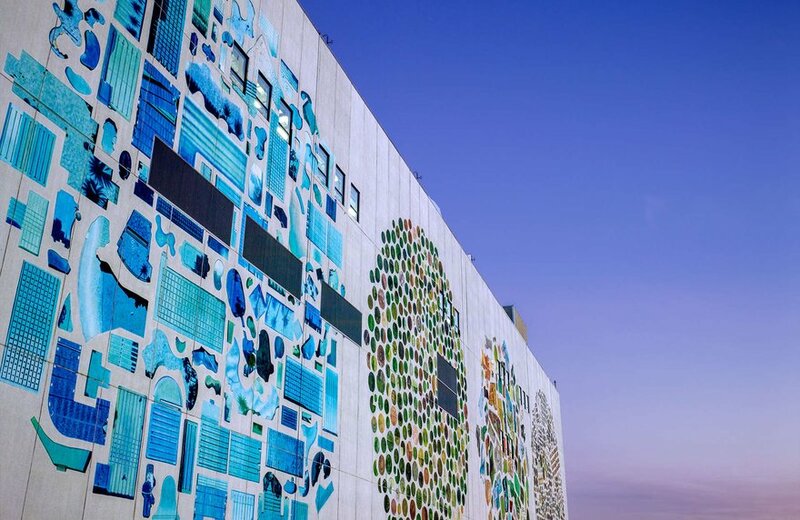 The side of the data center now features three disks, collaged together from images of pools, circular farming features, and water treatment plants. “I hope the people who work at the data center will have an opportunity to think about the kind of things that are enabled by the system they are working really hard to maintain,” says Odell in a video on the Project site. She chose the subject matter in order to work with global data that was mediated through data centers - and by including sewage plants, her subject matter also nods to the somewhat-unloved status of data centers. Meanwhile, in St Ghislain, Belgium, artist Oli-B decided to create “a great, colorful cloud”, constructed from images he absorbed on visits to the site. ”The point is for the people who work in the data center to be able to see themselves in the work,” he said. Both pieces were put together by the artists in their studios, and reproduced on the side of the data center, using a combination of projection and hand painting. It’s not the first time that data centers have inspired art and creativity. This year, The People’s Cloud, a documentary by Matt Parker, will be released. And designer Ivan Sergejev has proposed in Project Rhizome, that data centers could be humanized by including more playful elements such as swimming pools and climbing walls. Two more Google data centers are getting an artistic makeover: Council Bluffs Iowa, and Dublin Ireland.